If your dog's been diagnosed with diabetes, don't assume he won't be around much longer. The life expectancy of a dog with diabetes depends on various factors, including his age at diagnosis. Your willingness to treat him by giving daily insulin injections and his response to them are major considerations in your pet's prognosis. Without treatment, dogs might develop diabetes-related conditions, including blindness, and likely will die from the disease. Dog owner holding his dog on couch. Canine diabetes mellitus occurs when a dog's pancreas no longer produces sufficient insulin, a hormone necessary for glucose regulation, or his body no longer uses it effectively. The result is a soaring level of blood sugar. Diabetes symptoms include excessive drinking and urination, with increased appetite but subsequent weight loss. Your dog's breath might smell unusually sweet, and he may develop skin infections. Eye issues, especially cataracts, could indicate diabetes. The disease most often appears in middle-aged and older canines, with overweight animals at a higher risk. Fortunately, insulin injections and dietary changes can allow your pet to live a relatively normal life. Proper treatment of a dog with diabetes is a big commitment. Your commitment to your dog affects his prognosis. It's not so much giving him the once or twice daily insulin injections along with his food, but maintaining a consistent schedule. If work or other obligations means you can't always give your dog his injection and food at approximately the same times each day, you'll have to find someone who can do it for you. That means vacations and business trips require extra planning for dog care. Your vet might know of a reputable pet sitter who can give your dog insulin injections. You must bring your dog to the vet for regular monitoring, especially right after his diagnosis. Your vet will determine the appropriate amount of insulin for your pet, and will show you how to inject him. Initially, your dog will require a weekly checkup to monitor his glucose levels and response to the medication. She might adjust the amount of insulin your dog receives -- something you should never do without veterinary approval. Your vet might prescribe a diabetic diet consisting of high fiber, low carbohydrate food. 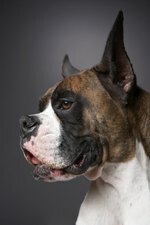 Expect to bring your dog in every three months or so for an examination and testing once he is responding to the insulin. Other factors influence your diabetic dog's prognosis. Many diabetic dogs are overweight, so your vet can tailor an exercise program for your pet to keep the pounds off. Another concerns finances -- the costs for all of those veterinary visits, the prescription diet, insulin and needles add up. That doesn't include payments for pet sitters to inject and feed your dog when you're unavailable. Be sure to budget accordingly. What Causes High Ketones in a Canine?